Preheat oven to 350°F (325°F for dark or non-stick pans.) Grease inside of six 8-inch baking pans. Optional: Line bottoms with parchment paper or non-stick tin foil. Beat the yellow cake mix, 3/4 cup water, 1/2 cup oil, 2 whole eggs and 1 egg white on low speed for 30 seconds, then increase the speed to medium and beat for 2 more minutes. 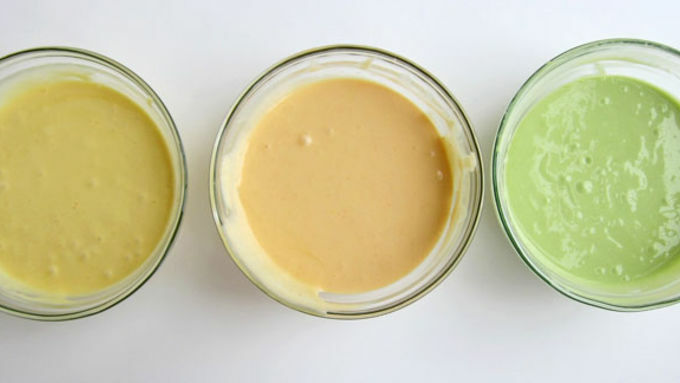 Divide the cake batter into 3 bowls. In one bowl make the yellow layer by adding 1 egg yolk. In another, add carrot juice to make orange, and finally add spinach juice to make the green batter. Beat white cake mix, 3/4 cup water, 1/3 cup oil and 3 egg whites on low speed for 30 seconds, then increase the speed to medium and beat for 2 more minutes. Divide the cake batter into 3 bowls. Add 2 tablespoons beet juice to one bowl to create fuchsia batter. Then add 3 tablespoons blueberry juice to another bowl to make blue. In the final bowl, add 2 tablespoons blackberry juice, plus 1 teaspoon beat juice. 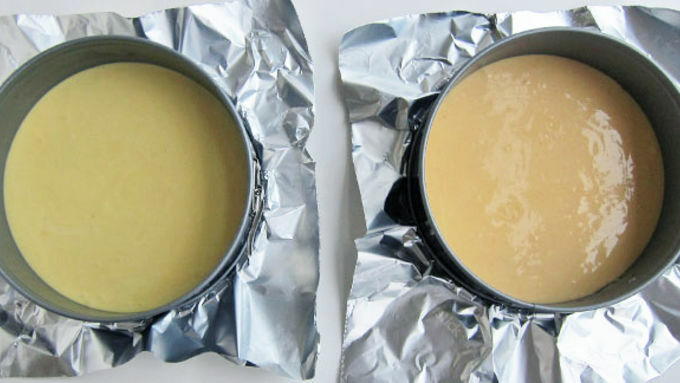 Pour batter into baking pans. Bake for 20-24 minutes until a toothpick inserted in center of cake comes out clean. Cool completely. Trim rounded tops off cakes to level, if needed. Place purple cake on a cake round or serving plate. Spread frosting over cake layer, then repeat with blue, green, yellow, orange and fuchsia cake layers. 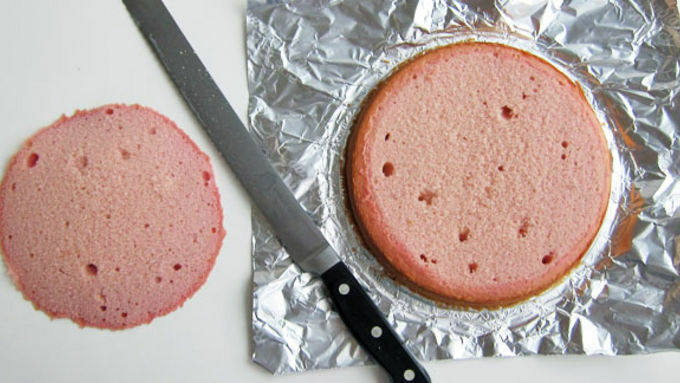 Spread light coat of frosting on top and side of cake to seal in crumbs, then frost with remaining frosting. 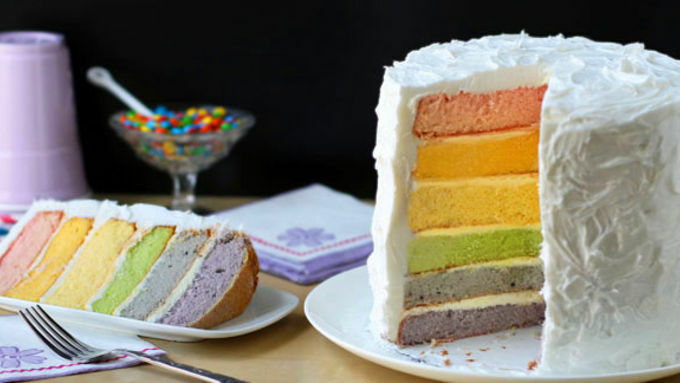 Rainbow cakes are all the rage right now. They are bright and colorful and add a touch of whimsy to any party. The only downside to these cakes is the amount of artificial food coloring used to tint the cake batter. Good news: You can use natural colorings made from things you can find in your own refrigerator! Things like carrots, spinach, beets, blueberries, blackberries, and egg yolks. 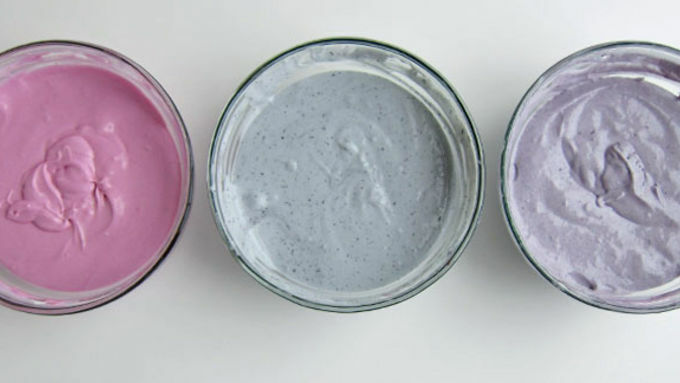 The juice from these fruits and vegetables can be used to make pretty, colored batter that bakes into soft pastel colored cakes and (surprisingly) imparts very little flavor! And you may be a tad nervous about the spinach and beet layers, but they taste just like cake – not like the vegetables used to color them! You can make the cake from scratch, but if you want to take a shortcut, you can use Betty Crocker™ cake mixes and frosting. It's easiest to start with one yellow cake mix to make the yellow, orange and green layers, and one white cake mix for the fuchsia, purple and blue layers. Note: The prep time for this recipe will vary depending on how you juice the produce. You can buy the fruit or vegetable juices from health food stores or just make your own. If you have a juicer, this is an easy task. If not, you can puree the fruits or vegetables in a blender, or use a stick blender. Then pour the chunky puree into a fine mesh strainer, and press on the solids with a rubber spatula or spoon, expelling the juice into a bowl set under the strainer. You'll need 2-3 tablespoons of each juice to add to the cake batter. The amount of fruits or vegetables you'll need will depend on how you juice them. We suggest having about 2/3 to 1 cup of carrots, blueberries, blackberries and spinach on hand. For the beets, you can puree them, or just use the red juice from a can of beets. We used 8-inch round springform pans to bake the cakes in and lined the bottom of each with non-stick tin foil, which made removal very easy. 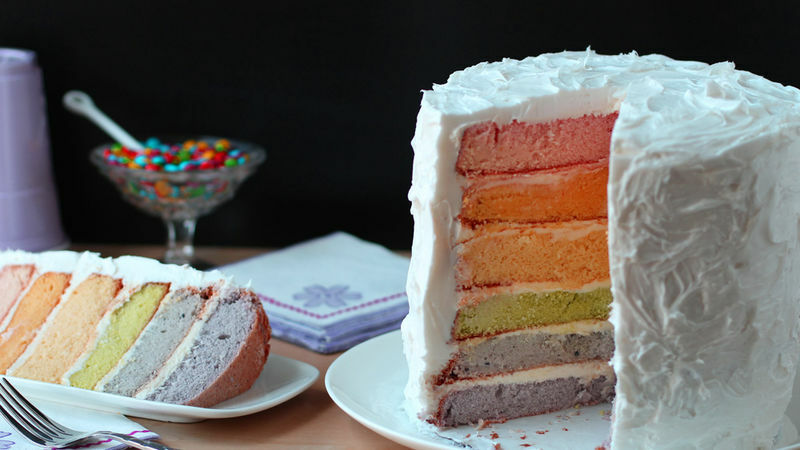 Cut a slice and enjoy your beautiful rainbow cake!